Ready your trekking boots and be prepared for a memorable experience in one of Patagonia’s most scenic and awe-inspiring locations. This full-day trip will see you trekking through lush forests and azure-tinted lagoons. And, for the grand finale: a sweeping view of massive Mount Fitz Roy and Laguna de los Tres (Lagoon of Three). This famous lagoon takes its name from the three peaks that can be seen from the shore: Fitz Roy, Poincenot, and Saint-Exupéry. This last granite giant was, in turn, named after famous French writer Antoine de Saint Saint-Exupéry, best remembered for his classic The Little Prince. An avid flyer, few people know that Saint-Exupéry pioneered postal flights in the Patagonia region between 1929 and 1931, during his tenure as director of the Aeroposta Argentina airline. 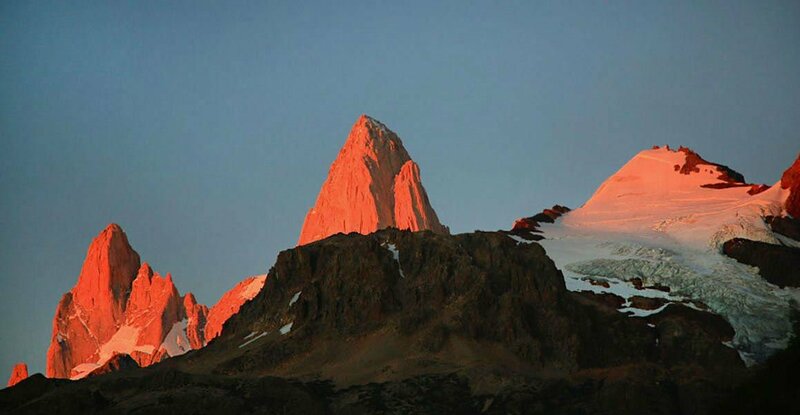 Without a doubt, however, the most famous rock giant of El Chaltén (and most of Patagonia) is Mount Fitz Roy. First climbed in 1952 by French alpinists Lionel Terray and Guido Magnone, it remains among the most technically challenging mountain ascents on Earth for professional mountaineers. Our day will begin with a transfer to the start of the trail, at El Pilar lodge, located 11 miles (17 kilometers) north of town, some 30 minutes away. Starting the trek from El Pilar lodge is a huge advantage for this trekking experience, because it allows you to return to El Chalten by a different trekking route than the one you’ll take on your way to Laguna de Los Tres (the furthest point of this trek). The ride itself is highly enjoyable for the panoramic views it offers of the valley as well as the serpentine-shaped rivers. As our ride continues, about 20 minutes in, we’ll start to glimpse the imposing Mount Fitz Roy. Our trek will kick off as we enter a thick lenga forest (indigenous trees which grow in the midst of strong winds and harsh conditions, stemming from the continental ice field.) One of our first scenic viewpoints: Piedras Blancas glacier – a hanging glacier – will gift us the chance to start creating memories, and photographing this unique work of nature. 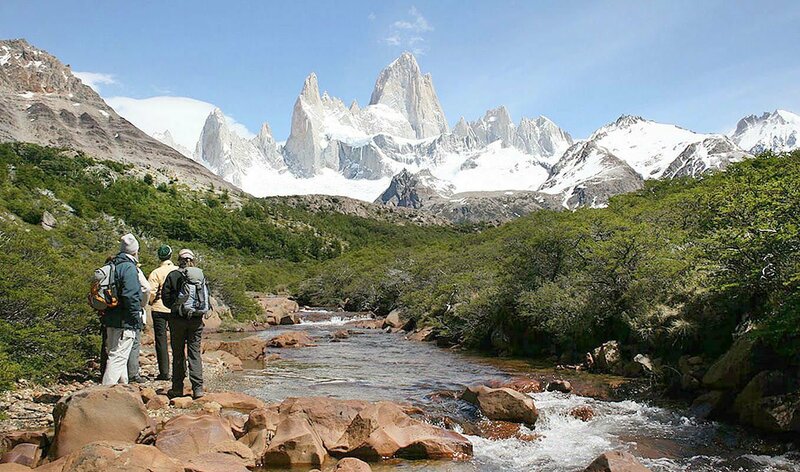 We’ll next leave the forest, and make our way towards a clearing where we can gaze upon the full splendor of Saint Exupéry, Poincenot, Fitz Roy, among other imposing peaks. 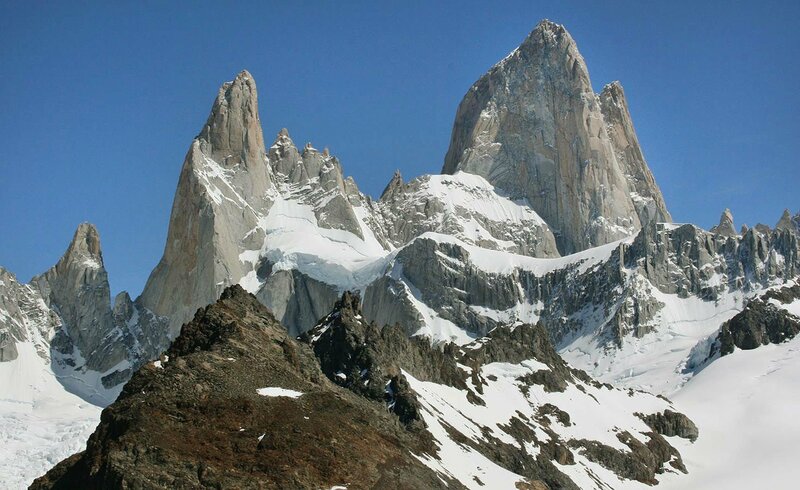 For the history buffs: Mount Fitz Roy was named after the captain of the H.M.S. Beagle, the ship famous for transporting the renowned author of ‘Origin of the Species’, Charles Darwin himself! Our Patagonian odyssey continues, as we arrive at Poincenot campground, located within a beautiful lenga forest, and inhabited by countless varieties of birds, keeping us company with their melodic singing and chirping, as we make our way to the Rio Blanco campground; the basecamp which hosts the most adventurous climbers, all eager to make a name for themselves and conquer these giants of nature. 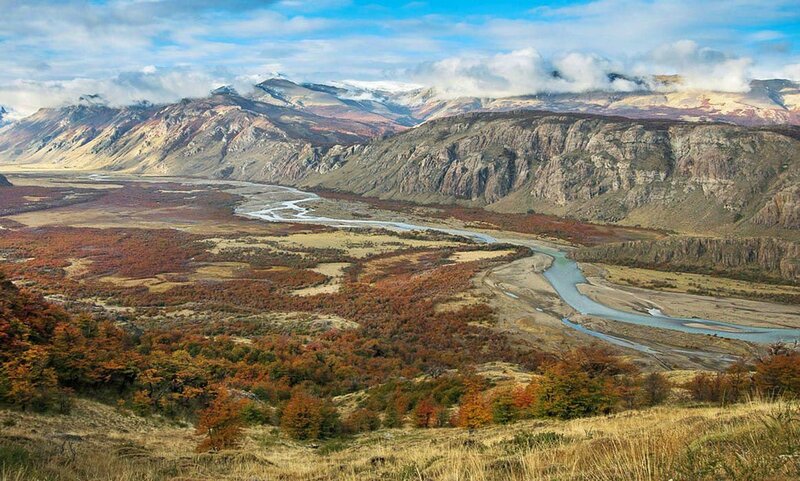 We’ll trek up 1300 feet (400 meters), for about 2 and a half hours, and if we are lucky, we may have the chance to see condors (the largest flying land birds in the Western Hemisphere) in their frequent glide to and from Mount Fitz Roy. 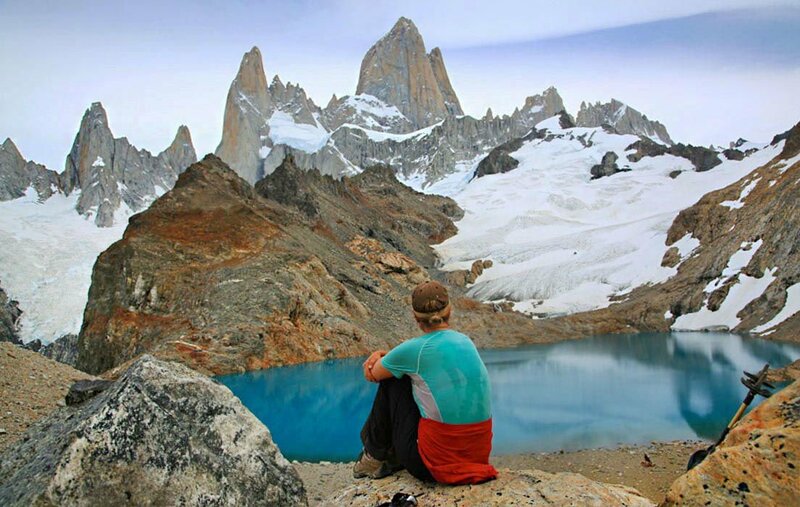 After the most demanding part of the trek (ascending an extra 1300 feet or 400 meters in an hour or so), we’ll reach Laguna de los Tres, where we’ll be rewarded with some of the most stunning views of Mount Fitz Roy. 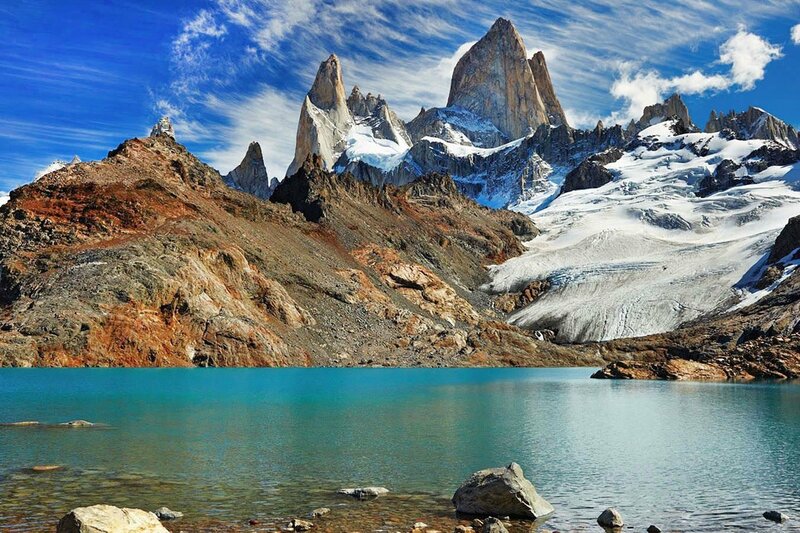 From here, we’ll make our way to Laguna de los Tres, which will offer a memorable, panoramic view of its glacier, feeding into the lake, with Mount Fitz Roy towering above. After a break, and bite for lunch, we’ll start back with our descent to El Chalten. On our way, we’ll make a final stop by one of the favorite spots of many photographers: Laguna Capri, where you’ll have the opportunity to capture amazing images of crystal blue waters with the dramatic backdrop of the Andes mountain range. Since you’ll be doing this tour with your own private guide, you’ll be able to enjoy each attraction at your own pace; making all of the stops you want while enjoying personalized assistance and care from your expert guide who will make any tour customization needed to help you make the most out of this trekking experience. Important: the tour’s exact itinerary and duration may change subject to weather conditions and decisions of the tour guide to optimize your tour experience. Difficulty: moderate. Trek distance: 12.5 miles (20 kilometers). Elevation gain: 2600 feet (800 meters). The hardest part of this trek is the ascent of the last 1300 feet (400 meters). As this is a private tour, if that last trail is too demanding for you, we’ll follow another easier and flat trail we also use. The highest elevation reached is 4000 feet (1200 meters). Duration: full day (approximately 8 to 10 hours is the usual duration, depending on your pace). Vehicle: private vehicle for the initial transfer to Hosteria del Pilar, to start your trek. 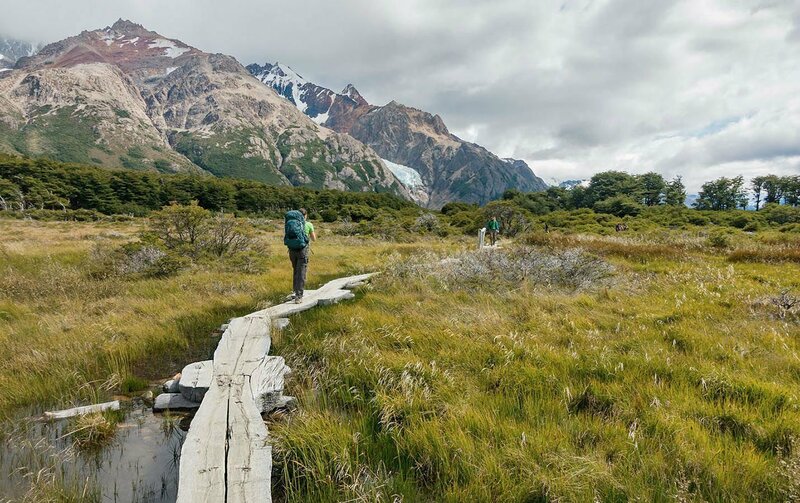 Starting the trek from El Pilar lodge is a huge advantage for this trekking experience, because it allows you to return to El Chalten by a different trekking route than the one you’ll take on your way to Laguna de Los Tres (the furthest point of this hike). If you don’t start from Hosteria del Pilar, you’ll have to go and return through the same trekking route, also missing some important highlights. Includes: lunch-box and bottled water.